The World Council for Nature (WCFN) laments the surprising decision of the Australian Medical Association (AMA) to deliver a clean bill of health to victims of industrial wind turbines, without having conducted an epidemiological study or seen any of the patients. Windfarm neighbors around the world have been requesting for some time that health authorities would carry out such a study, including the measuring of infrasound peaks and seismic vibrations inside neighboring homes. But this is being denied to them. Physicians at large are helping the industry, not its victims. 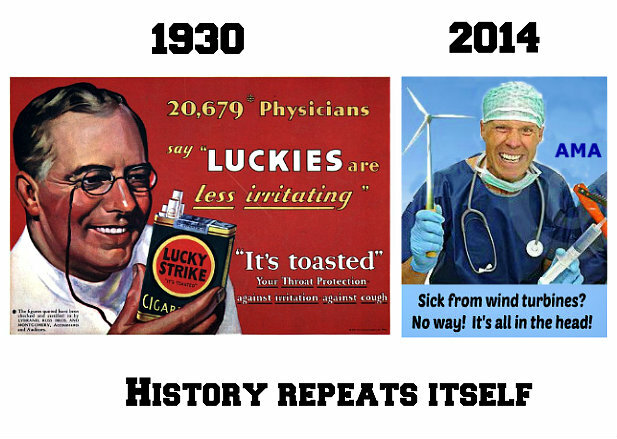 It’s a repeat of the doctors-for-tobacco propaganda from years back. Courtesy of Craig Kelly, MP, Sydney. AMA asserts that windfarm neighbors suffer from anxiety, nothing else, and that anti-windfarm campaigns are the cause (1). In other words: it’s the nocebo effect, which “originates exclusively from psychological sources” (Wikipedia). 1) – 400 goats died in Taiwan in 2009. These animals, kept on a windfarm, were unable to sleep: “the goats looked skinny and they weren’t eating. One night I went out to the farmhouse and the goats were all standing up; they weren’t sleeping” (2). 2) – In Denmark, which is the EU’s leader in mink farming, millions of Danish kroners were lost in damaged pelts when wind turbines started to operate near a mink farm. The animals became aggressive, attacking one another, and resulting in many deaths. The owner was heard by Members of Parliament, who were stunned (sic) to learn that wind turbines were not as harmless as the wind industry had told them (3). 3) – In Poland, a recent peer-reviewed study on domestic geese concluded that: “the results indicate the negative impact of the immediate vicinity of wind turbines on feed consumption, weight gain and cortisol concentration in blood” (4). 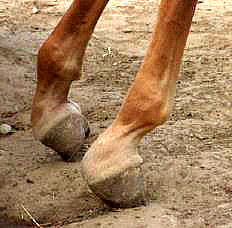 5) – A study from Portugal shows that foals born and raised near wind turbines developed Equine Flexural Limb Deformities. “The results presented herein strongly suggest that the presence of LFN-generating WT in the vicinity of this horse breeding farm can play a significant role in the triggering and onset of equine flexural limb deformities” (LFN: low frequency noise – WT: wind turbine). (7) It was published by the Universidade Lusófona and formed the basis for a thesis at the UNIVERSIDADE TÉCNICA DE LISBOA (8). 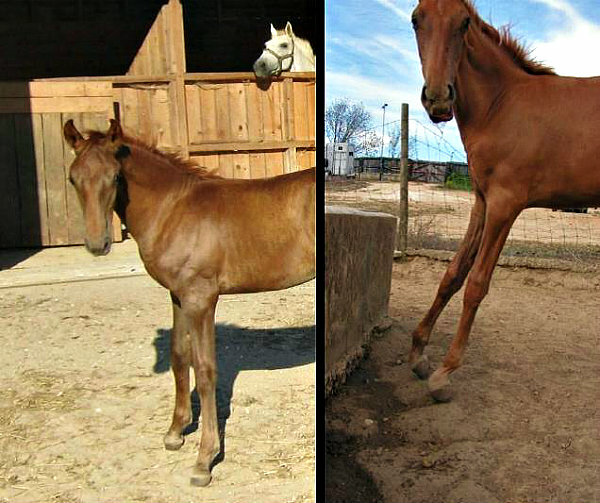 The above image shows the same foal at 3 and 6 months of age. Club feet – LFN can cause a thickening of blood vessels walls. • In cattle: missing eyes and tails (updated Excerpts from the Final Report of the Township of Lincoln Wind Turbine Moratorium Committee). “It is disturbing to me that in chickens and cows in separate wind farms (separated by 50 miles) similar teratogenic effects are being observed, namely missing eyeballs. Based on the correlation of effects seen experimentally and those seen in the wind farm in chickens, these defects may be due to low frequency vibration. Jim Vollmer, the farmer who owns these chickens, reports that the tin structures on his farm buildings vibrate. If the infrasound/ low- frequency sound is strong enough to vibrate structures on his farm as it passes through, what is it doing to the delicate connections and circulation inside the developing chicken embryos, and inside people, as it passes through them? 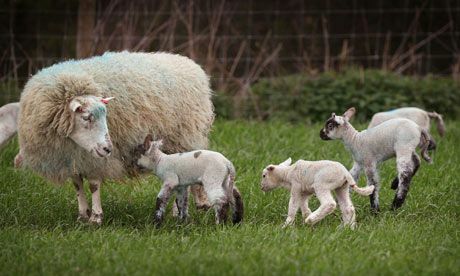 7) – There are many more accounts of wind turbines affecting animals, for example shepherds’ dogs refusing to work, or even get out of the kennel (10). People have also reported the disappearance of wildlife around wind farms, except for visiting birds and bats, and scavengers which come to feed on their carcasses. The above circumstantial evidence is more than enough to warrant a thorough epidemiological study on windfarm neighbors who complain about Wind Turbine Syndrome, and on their animals. Applying the precautionary principle, a moratorium should be called on windfarm development until such time as the study is published and analysed. To guarantee against bias, and to keep it simple, half of the professionals involved in the study should be approved by WCFN, which can’t be accused of being pro-windfarms. WCFN oppose wind turbines because of their deleterious effects on biodiversity, but we are not insensitive to the harm they do to people. We too believe in this principle contained in the Hippocratic oath: “primum non nocere” – first, do no harm. This is an amazing litany of harm! I hope much more scientific research can be conducted soon!